MARBINOL- PLUS is a concentrated liquid detergent with a blend of surfactants and can be used for removing soil from the floor. MARBINOL - PLUS can be used to clean floors in factories, garages, workshops, restaurants, hotels, offices etc. MARBINOL PLUS is effective in removing oil, grease and dirt from the surface. Normal soiling: Use 20 ml in 1 litre of water. Heavy soiling: Use 40-50 ml in 1 litre of water. Can be used directly to remove oil and stains. 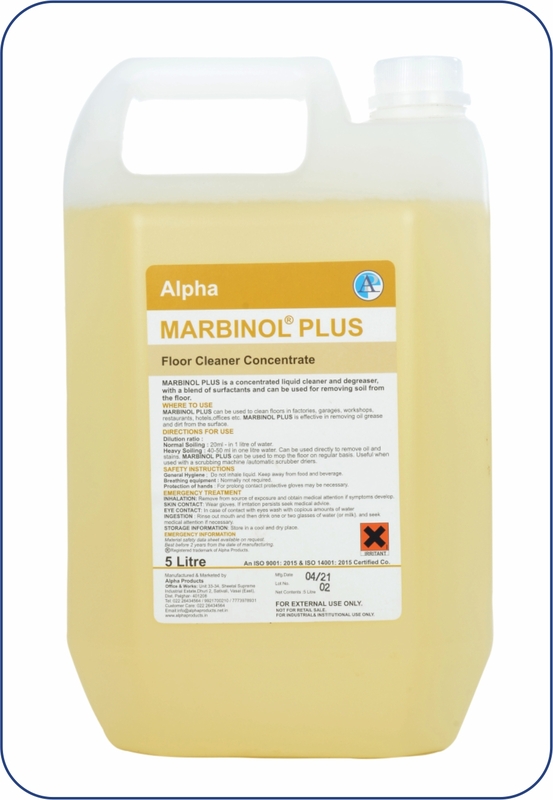 MARBINOL- PLUS can be used to mop floor on a regular basis, useful when used with a scrubbing machine/ automatic scrubber- driers. MARBINOL- PLUS is slightly alkaline, for sensitive skin protective gloves should be used. In case of contact with eyes, rinse with plenty of water and seek medical advice.